My ten year old son and I recently returned from a trip to Alabama to visit relatives. It’s a trip that I make every year or so; which for me, the person who doesn’t like long car trips, is a big deal. Every year that I go, I claim it will be the last time. This year was no exception. In spite of the 500+ miles each way, there were moments that resonated within me — many of which revolved around what I saw when I looked into the eyes of others. I always make it a practice to look intensely, especially when it’s someone I want to reach on a deeper level. While in some countries eye contact is considered rude and/or offensive, I’m glad that our Western tradition encourages it. After all, eyes are truly windows to the soul. I believe that eyes are indicators of one’s core — who that person really is, who they desire to become. I love looking into eyes filled with love, excitement and hope. 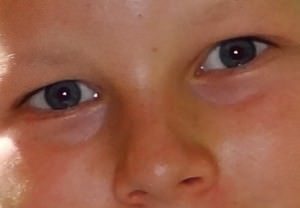 I know that eyes holding such energy have a pure spirit that will bring only good for themselves and the world around them. Destiny: I had the pleasure of working over four days in a dance studio with my lovely, twelve year old niece Destiny. In her eyes I saw wonderful things: sweetness, adventure, eagerness, sincerity and resilience. There was the occasional look of self-doubt, which we both worked hard to successfully eradicate. The result of our hard work was a fun cha-cha routine, of which we were both very proud. Afterwards, I saw in Destiny’s eyes a sense of accomplishment — a knowing that she can do anything that she sets her mind to. Ryan: While my son Ryan doesn’t really know my extended family, I’ve never seen a child more thrilled to meet his aunts, uncles and cousins. In his eyes I saw openness, joy, enthusiasm, gentleness and affection as he greeted each new relative with a sense of excited curiosity. I was most moved when he and I visited my 93 year old grandmother who lives in a nursing home. He didn’t remember her from our last visit but he quickly ran to her bed and threw his arms around her like he had been doing it every day of his life. Jesse: And that brings me to the last beautiful pair of eyes, those of my maternal grandmother Jesse. As I looked into her eyes I saw acceptance, love and a spark of childlike innocence. While we gazed into each other’s eyes, she kept telling me, “You look just like my girls!” Since she has six living daughters, of course I wanted to know which one she thought I looked most like. I don’t know if I’ll be driving back to Alabama anytime soon, but no worries. I’ll hold onto the memories of loving eyes to tide me over.